The Cave Creek Recreation Area (Now known as Cave Creek Regional Park) is nestled in the foothills of a small range just north of Phoenix, Arizona. Located off of 32nd Street north of Carefree Highway, this area has a vast and colorful history. The park and it’s trail system are an expansion of old mining trails from the 1870’s when Jasper and other minerals were mined from the hills around the park. Some of the old mine sites are still visible even though many of them have been closed off for years for safety reasons. The park includes 2,922-acres of beautiful, classic Sonoran Desert scenery and the new visitors center offers classes and lectures about the flora and fauna of the area. My all time favorite loop in the park is a combination of two different trails that intersect and create a 6.5-mile loop. The Overton Trail heads out from the main parking lot at the visitors center and takes you west (clockwise) at a nice, gradual incline into the depths of the park. 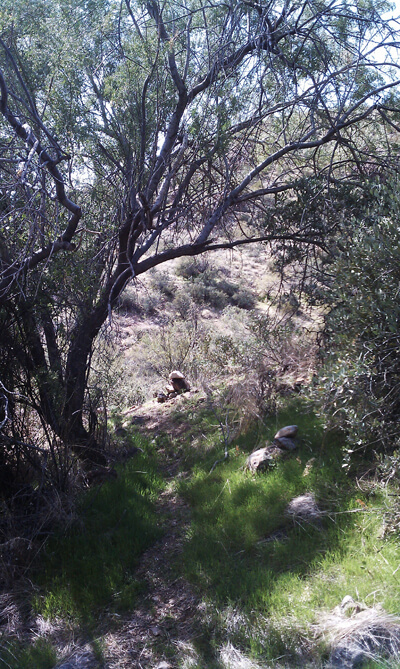 The trail here is very well maintained and an easy walk. This is a multi-use park and the trails see a fair share of bikers and horses so watch out for both. As the trail crests the first rise you get a fantastic view of the western ridges in the distance and is absolutely fantastic for well timed sunset photos. The trail wraps around the west side of the mountains that make up the heart of the park and allows you to climb up and around the back of the mountains where you leave all signs of civilization behind. For a park that sits surrounded by residential developments, the back side of the park (north side) gives you the feeling of being in the middle of nowhere. The Overton Trail tops out at a flat landing where a small bench has been erected for those needing a quick rest. 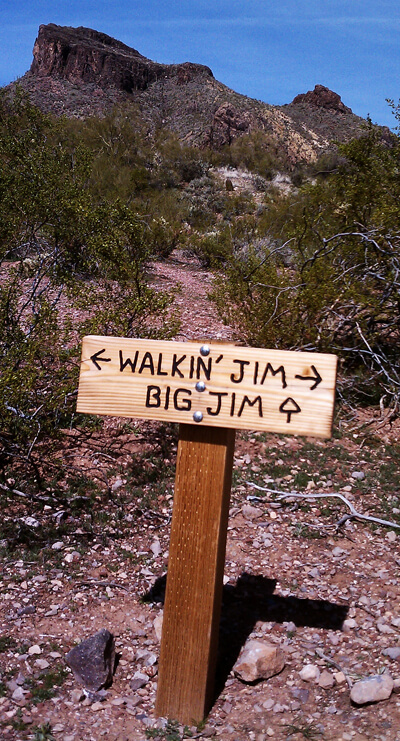 Shortly after the landing, the trail connects to the Go John Loop. This secluded section of hiking winds down a very flat, easy section of trail that has seen a lot of maintenance over the years. This section is usually where I work on some trail running and try to slam through it at a good pace because it’s not until you reach the bottom of the wash that the trail becomes interesting again. From the bottom of the wash the trail turns into a mixture of sand, loose rock, ragged exposed bedrock and everything in between. 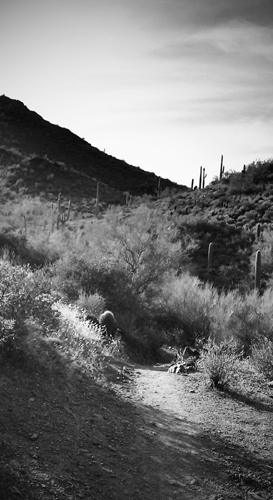 The trail winds though the vegetation offering up-close and personal views of some of the Sonoran Deserts most famous wildlife. 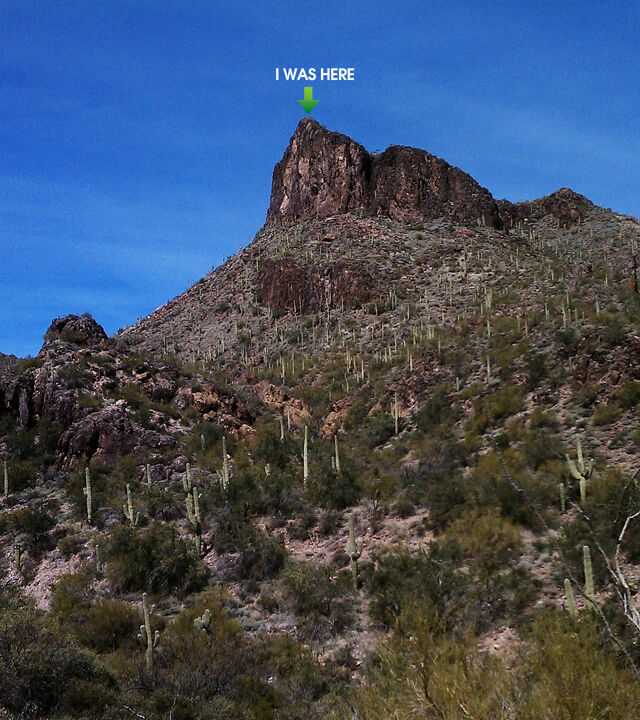 Palo Verde Trees, Mesquite, Saguaros and Barrel Cactus highlight the trail. 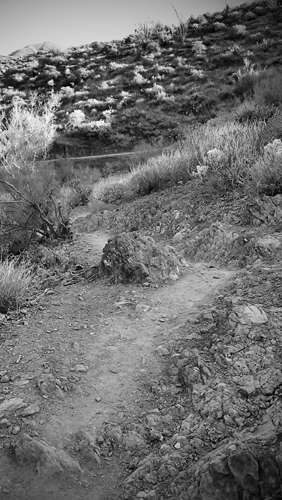 As the trail climbs out of the wash there is a short section that some hikers find challenging and Mountain Bikers can practice their technical skills. Once past this climb, the trail pretty much levels out and becomes a nice, easy hike to the east side of the range. From the east side you get a glimpse through the valley to the town of Cave Creek and the residential properties that back right up to the park. The trail meanders right along a barbed-wire fence the marks the eastern boundary of the wilderness area. Watch for Mountain Bikers through this section as the trail is perfect for them to pick up speed. The tail end of the trail is a slow, easy descent to the east parking lot. Once back at the parking lot you can either walk road side back to the main lot at the visitor’s center or hike a section of trail that takes you through the middle of the developed part of the park. There are tables and gazebo picnic areas, a kids playground, barbecue pits and public restrooms. I have often done this loop and not seen anyone on the trail, but returned to find a very active park with kids playing families having lunch. Cave Creek Regional Park offers overnight camping in designated areas and trail rides on horseback during part of the year. Check with the ranger at the visitor’s center for rules and fees. As with all of the Maricopa County Parks, there is a $6 per vehicle fee to enter the park for day use. Annual Passes are available for $75. Follow Maricopa County Parks on Twitter!